HomeBlogIs it worth investing in Google Adwords if I show up first in searches? Is it worth investing in Google Adwords if I show up first in searches? Will Adwords bring more reservations? Will I cannibalize the traffic coming from natural search (considering that hotel is well positioned for its name)? Up to 30% Google clicks go to first 3 sponsored listings! Additionally, people searching hotel names are determined to find one, exact result. Most probable is that user chooses first accurate result found – without deeper result page analysis. It all looks reasonable in theory but will it work for a hotel? Turning off Adwords does not necessarily mean that hotel looses 40% fo visits, but chance that most of those 40% goes to intermediaries is very high. We investigated further – what part of new sales would be driven by Adwords? Test – Adwords as the source of up to 25% new hotel reservations from Google. 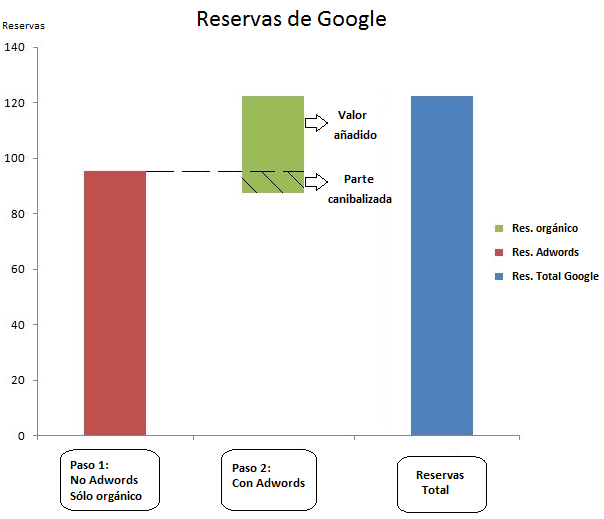 We made an exaperiment to determine the change in paid vs natural search reservation number and visit cannibalization. 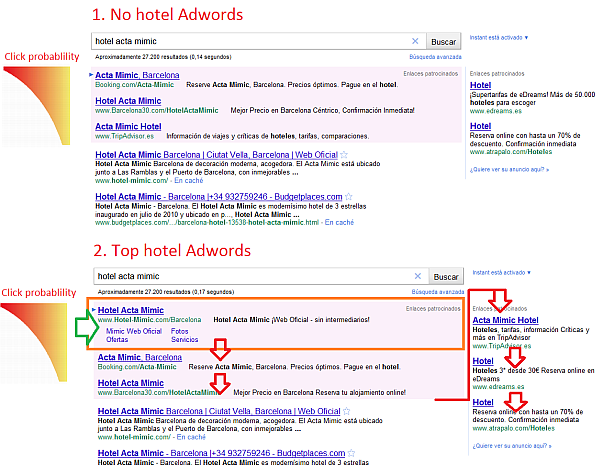 We have chosen two periods of time for a popular 3 star hotel in Madrid center with a top natural Google positions. First period with Adwords campaigns running (total 122 conversions from Google including 34 from Adwords), second without campaigns (96 Google conversions, only natural visits). It reflects most hotel cases that we run – Adwords and natural search results are complementary. Also, cannibalisation is marginal if hotel is not top for its name. Considering the huge number of hotel name/city query variations (especially translations, synonyms) – possibly not all of them are cover by good hotel natural results. In Adwords keyword combination number is unlimited and You can be still 1st for all of them. Conclusion: On the average 10-50% of all search engine visits are driven by Adwords due to its top positions. Cannibalization exists but you still get more reservation doing Adwords than without it. In our case it was 21% new reservations from search engines but it can be much higher – we present details in our 10 hotel Adwords Case Study including Adwords camaign costs/commision. Results depend mostly on many offline factors (prices, availability, hotel webpage) and continuous Adwords optimisation. 1. In total hotel benefits from more reservations despite its position in natural results – you bring those reservation to your official site where commission is low. 2. Hotel pays for Adwords anyway due to intermediaries commissions like booking.com because they occupy ad places for your hotel name gaining visitors. If it is profitable for them with certain commission, should be for a hotel. 3. You can personalise hotel ads adding links, addresses, promotional texts. Intermediaries do not focus on such details. 4. It is easy to appear in top 3 Adwords results for the official hotel page – Google promotes good relevancy (keyword to website content, domain name) as a factor in final cost per click calculations. Mirai hotel campaigns get Quality Score from 7/10 to 10/10 (Adwords relevancy algorithm). 5. Cost of campaigns can be relatively low however depends on many offline factors (hotel webpage, prices, offers, availability) – in our Adwords Case Study we present possible commision hotel would pay to Google for Adwords (average 3-10%). Great article! Very much to the point! Thank you a lot!